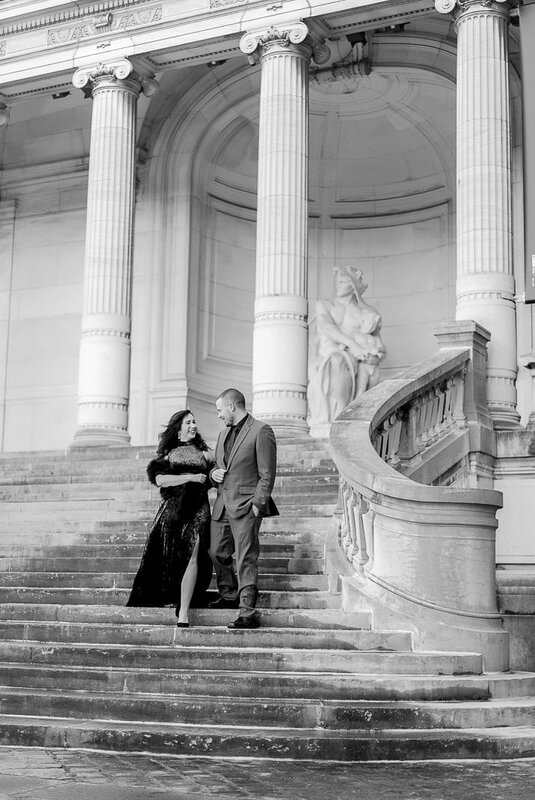 Thinking about booking a Paris Photo Shoot during your trip? Here are some inspiration and tips for getting the most out of it! Happy Valentine’s Day, everyone! I hope you all have grand plans, be it a fancy night on the town or pizza, sweats, and romantic comedies – because that sounds pretty grand to me right about now. 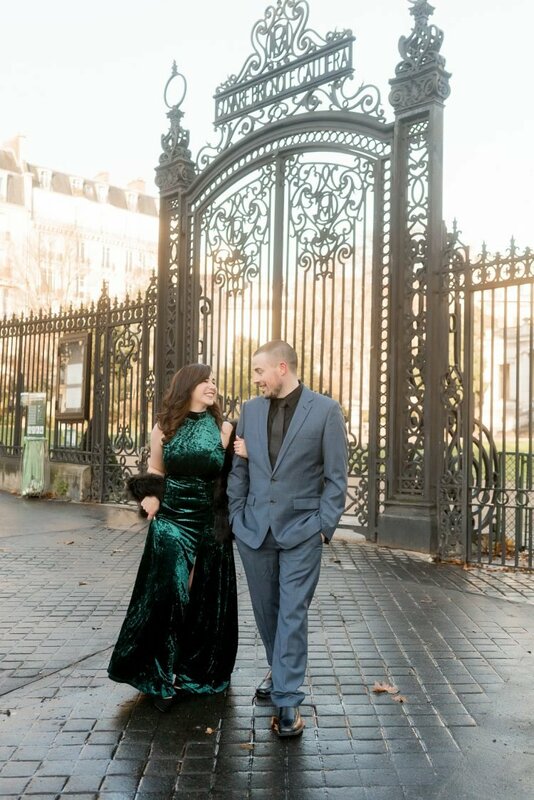 Since today is all about love, I thought it would be the perfect day to share some of the photos from our couples photo shoot in Paris in December as well as some tips for booking your own romantic photo shoot! But I’m so glad I forced him to do them. I know these photos (as cliché as they may seem) are ones that we will cherish forever. I hope that they inspire our children to travel, to find true love, and to never let anything get in the way of their dreams. Even though our photos were done in mid-December and it was FREEZING cold, it was still a lot of fun. I think this is something every couple should splurge on when in Paris (or any major city for that matter) even if it means you’re slumming it a bit in a rowdy Airbnb for your trip to stay within your budget. So anyway, onto all the details about out Paris photo shoot and my tips for making the most of it! Also, please note that I have an image optimizer built into my site, so the quality of the original images is far better than what you see here. Anniversary – If you’re taking the trip to celebrate an anniversary, what better way to capture the years of love than with an epic photo shoot with Paris as your backdrop! Proposal – It’s true, every girl wishes that special moment was captured so she could relive it until the end of time. So if you’re planning on popping the question in Paris, don’t forget the photographer! Because Paris – I mean, it is Paris and what better place to get dressed up and be fancy just because you can. Plus, it’s totally fun to feel like a movie star in Paris for an hour! We booked our photo shoot with L’Amour de Paris, I looked around for about a week online for a photographer that fit our style and budget, but it was actually a friend who referred me to them. She had had a friend use them last year and had nothing my good things to say. So I emailed them with my inquiry and made sure they were available during our trip since we were working on a tight timeframe. Luckily, they had a morning appointment left on our second day in Paris and I decided to jump on it. CheyAnne did our photos and she was great to work with, she made us feel comfortable and turned our photos around pretty quickly. I also loved that the L’Amour website was such a great resource for travelers with tons of recommendations for the city. There are so many options when it comes to gorgeous backdrops in Paris, but since we only did a 1-hour shoot and I wanted the iconic Eiffel Tower in some of them, I needed to pick locations that were close together. 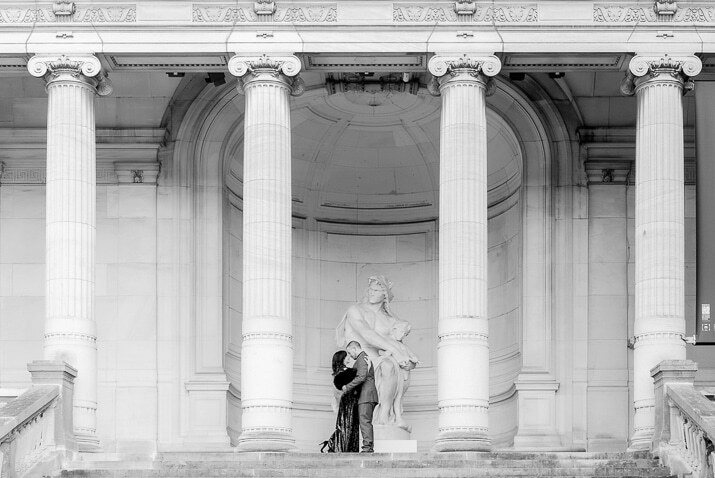 We ended up choosing Trocadero and the Palais Galleria, they are very close to each other and allowed us to maximize our time with the photographer. You can check out the full list of locations. I think a photo shoot in Paris is the best excuse to get dressed up! Even if you don’t want to get as fancy as we did, I would still recommend doing at least a cute dress and button down. Make sure that your outfit will show off your figure and makes you feel amazing, because the better you feel, the better you’ll look in your photos! Also, make sure to take some care with your hair and makeup. Matt wore a blue J. Crew suit and I wore this dress. I really wanted Matt to wear all black, but figured convincing him to buy a new suit was a battle I wouldn’t win. But we made it work and I absolutely adored my dress. It was heavy and thick so it helped keep me sorta warm! I would highly recommend bringing a small bag with an alternative pair of shoes if you plan on wearing heels for photos. However, I would recommend that you leave most valuables at home since you’ll be having photos of you taken and you won’t really have anywhere to put your things. We had our winter jackets with us and made out okay by setting them off to the side, but where we could see them. I’m so grateful that I have these photos, not only was it fun, but when I look back on our trip to Italy we have 1 whopping photo together, ONE! And when I look back on our trip to Ireland and Scotland, I think we have maybe 5. So I’m glad that we got some photos while we were in Paris. As a photographer, adventurer, and wife, they are by far the best souvenir EVER! 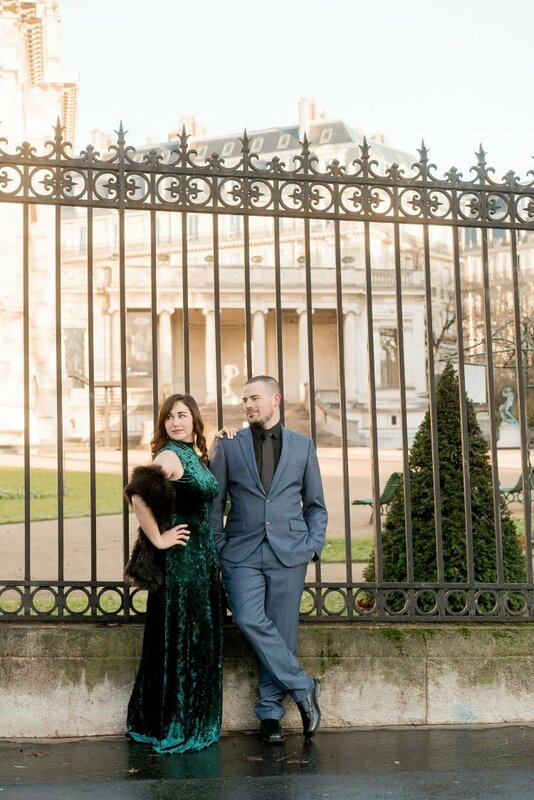 So if you’re planning a trip to Paris, I highly recommend booking a photo shoot, you won’t regret it! I was searching for tips and advice on holding a fashion shoot in Paris for a fashion client photo shoot (in Paris) and came across this post, and I’ll tell you what I didn’t need to search further. Great article with some brilliants tips and the link to L’amour de Paris was very interesting with some brilliant locations and concepts to go with. This is the second time I’ve found your site via Google and I’ll tell you what I’m definitely adding you to my favourites. Glad you found the post helpful, I hope your client loves Paris!